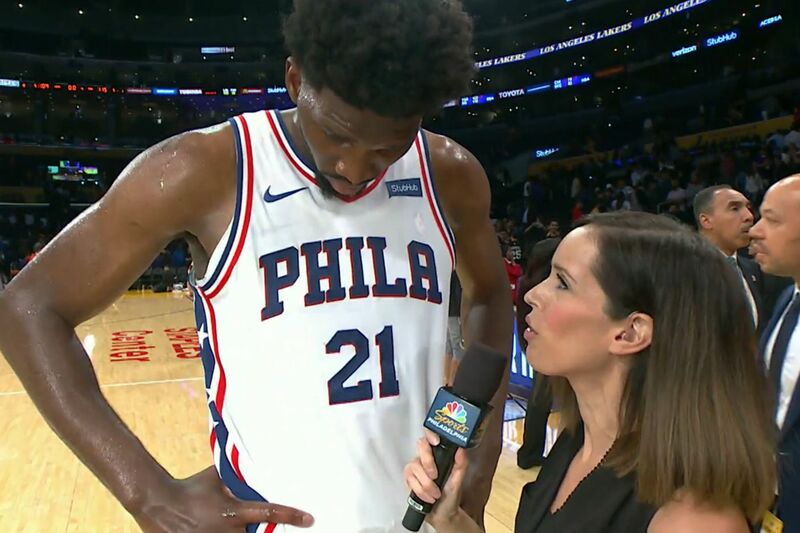 Molly Sullivan, seen here interviewing Joel Embiid, will no longer be the Sixers sideline reporter for NBC Sports Philadelphia, a position she's held since 2012. Yet another longtime sports personality has been shown the door at NBC Sports Philadelphia. Molly Sullivan, who has been the network's Sixers sideline reporter since 2012, announced on Twitter Tuesday evening that NBC Sports Philly was moving in a "new direction," a decision she called "heartbreaking." Even in light of other recent high-profile ousters at the network, Sullivan's departure is surprising, considering she been a staple of its Sixers coverage for years. Last season, NBC Sports Philadelphia posted its highest Sixers ratings since the 2011-12 season, which were up 45 percent over the 2016-17 season. Scott O'Neil, the CEO of the Sixers, was among those weighing in on social media about the network's decision. O'Neil, who joined the team in July 2013, wrote that he appreciated Sullivan's professionalism and approach to covering the team, which produced "honest, filled with high integrity and entertaining content." NBC Sports Philadelphia confirmed that longtime play-by-play announcer Marc Zumoff and analyst Alaa Abdelnaby would return to call Sixers games next season. It's unclear whether the network will replace Sullivan, though it would be unusual to have an NBA broadcast without a sideline reporter. "We thank Molly for her work as our Sixers sideline reporter, and wish her the best in her next chapter," the network said in a statement. Sullivan's departure is just the latest in a series of high-profile exits that have come as the network has rebranded itself from Comcast Sports Philadelphia and shifted its programing away from original reporting to more opinion and debate, such as the recently launched telecast of Mike Missanelli's 97.5 The Fanatic show. It also comes as parent company Comcast has made a potentially hostile $65 billion offer to purchase 21st Century Fox's entertainment businesses, a deal that would include Fox's 22 regional sports networks. In April, NBC Sports Philadelphia didn't re-sign Marshall Harris after his contract expired. In June 2017, veteran reporters Dei Lynam and Tim Panaccio left the network after veteran broadcaster Ron Burke was shown the door earlier that same year. Prior to that, longtime Phillies reporter and anchor Leslie Gudel and her former co-host, Neil Hartman, parted ways with the station. Following the cancellation of Breakfast on Broad in February 2017, former co-hosts Sarah Baicker and Jillian Mele left the network to pursue other other opportunities. Mele is currently a reporter and morning news anchor at Fox News.